Petacchi wins Giro stage 2. Cavendish angry in pink. 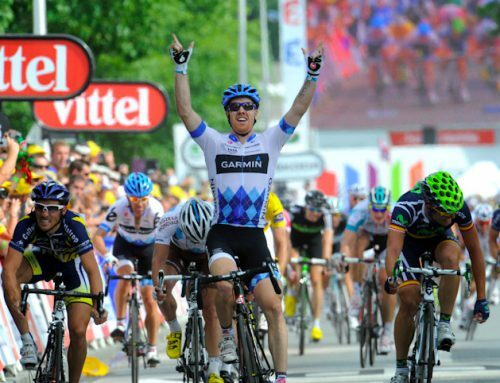 Home/Garmin, Giro d'Italia, HTC-Highroad, Mark Cavendish, Tyler Farrar/Petacchi wins Giro stage 2. Cavendish angry in pink. Two men shaking their fist in Parma, Italy. 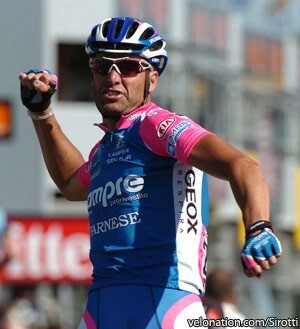 When Alessandro Petacchi crossed the line inches ahead of Mark Cavendish, he pumped his fist in triumph. Just to his left, Cavendish was ready to stick his first through the Italian’s face. It was an almost comical scene as the Lampre sprinter cruised past the finish reveling in his win while refusing to look at Cavendish — who practically had steam coming out of his ears. There are at least two sides to every sprint and Petacchi didn’t buy his rival’s story. “I don’t think I did anything wrong in the sprint. When you see someone coming up you go looking for him and I moved a bit, but I didn’t do anything wrong. But I apologise if I did,” said Petacchi. Cav did take the pink jersey, but it was an angry pink. He didn’t even look happy on the podium when the podium kisses his cheeks. Until the final final 500 meters, the battle appeared to be between Tyler Farrar and Petacchi. Then Mark Renshaw quickly brought Cavendish up to the front. Petacchi tucked behind Danilo Hondo, then caught Cavendish a bit by surprise as he launched up the right side. Then came the fist-shaking move. As Cavendish closed in on Petacchi, the Italian swings — drifts — intentionally slides — over the the left. It’s wasn’t a slam someone against the barrier move, but it was enough to take the edge off Boy Racer’s sprint and gave Petacchi those few inches he needed to win what was nearly a photo finish. What followed was a four-pack of angry gestures from Cavendish. 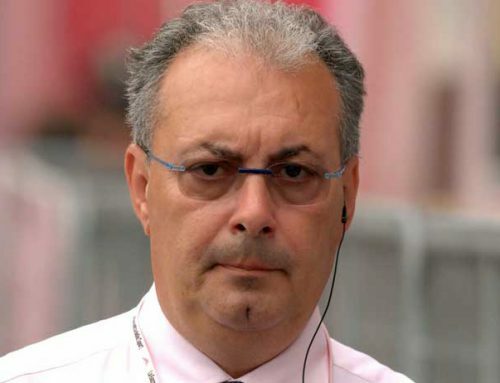 He did the WTF wave of disbelief, the accusatory finger point, the angry fist shake and finally a sweeping horizontal slash with the hand signifying “no, your win doesn’t count.” Petacchi missed them all — he was too busy playng to the tifosi and hoping his son Alessandro junior saw dad on TV. When Cavendish calmed down, he issued a retraction of sorts, not the anger, but the target. “In the past every time I moved one centimetre from my line I was disqualified but this isn’t Alessandro’s fault,” said Cavendish. 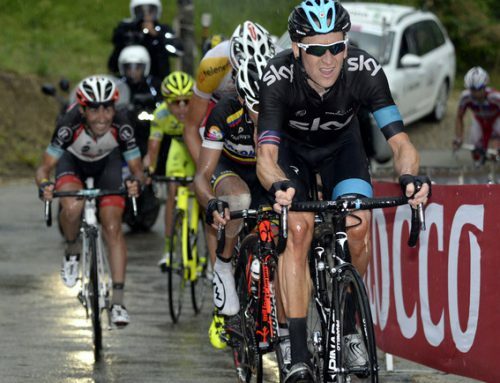 “This is the fault of the organisers or the commissaires or whoever is in charge at the time. For me I felt hard done by because for the same movement I would be disqualified.” The Brit should remember this is Italy, the Giro, and the judges saw nothing serious enough to penalize a famous Italian rider with great hair and a beautiful wife. Hours later Cavendish had undergone a compete personality transformation and showed an impressive and perhaps unexpected maturity. 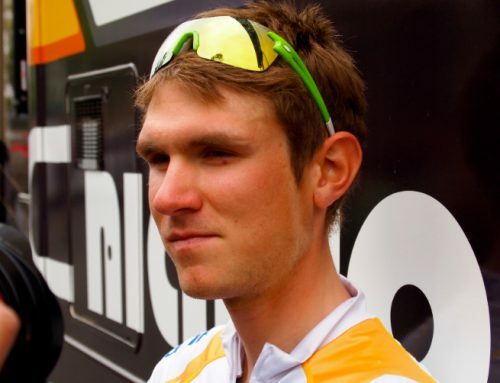 “So I’m sorry to Petacchi for taking my frustration out on him. What happened today is sprinting and that’s why I love it,” he tweeted. “It’s about tactics as well as power. Let’s bring back old school sprinting! Congrats to a great champion today.” He ended the day on a class note, one we should not forget. I was impressed by Cav's gracious tweet as well, and I don't blame anyone for getting heated in the middle of battle. Aggression, adrenaline rule over most rational and mature thinking in such cases! Besides, it's made for an interesting day of debate on sprinting "etiquette." "The Brit should remember this is Italy, the Giro, and the judges saw nothing serious enough to penalize a famous Italian rider with great hair and a beautiful wife." That winner looked a little too skinny to be Petacchi. Has anybody seen Petacchi and Cipo together in the same place lately?